"We're making a few changes around here," Chuck Todd said as he began moderating his first edition of "Meet the Press" on Sunday. The storied political talk show -- the first of its kind, it provided the template for so many that followed -- looked and felt a bit different with Todd in the chair and a panoply of executives behind the camera. They are determined to revitalize "Meet the Press" following the awkward departure of David Gregory. On Sunday, that translated to a lively telecast with an updated set, a new panel of political analysts, and a segment titled "Who Needs Washington?" that sought to acknowledge viewers' frustrations with D.C. gridlock. "The program and this studio will continue to evolve over the coming months," Todd said before showing excerpts of his weekend interview of President Obama. Todd is the ultimate political insider -- a lover of the "game," as he puts it -- yet he wants and needs to make sure "Meet the Press" is appealing to outsiders, too. 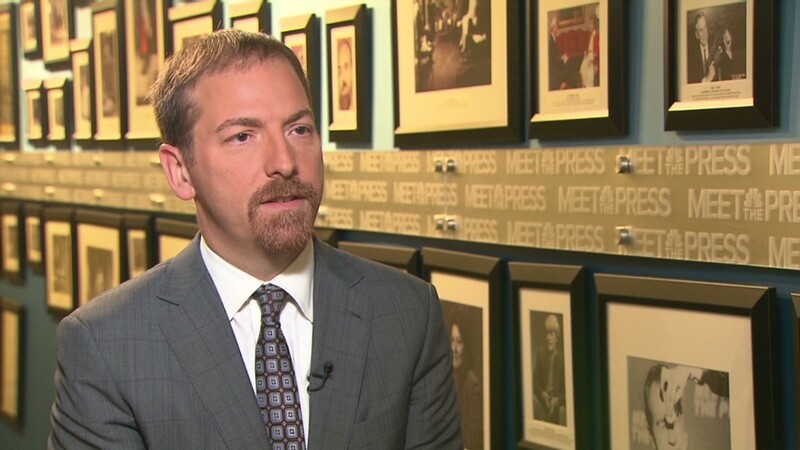 "When 'Meet the Press,' when all political journalism is at its best, it's when it's channeling America's frustrations back through and translating that to Washington and power players," Todd said in an interview at NBC's Washington bureau on Friday. 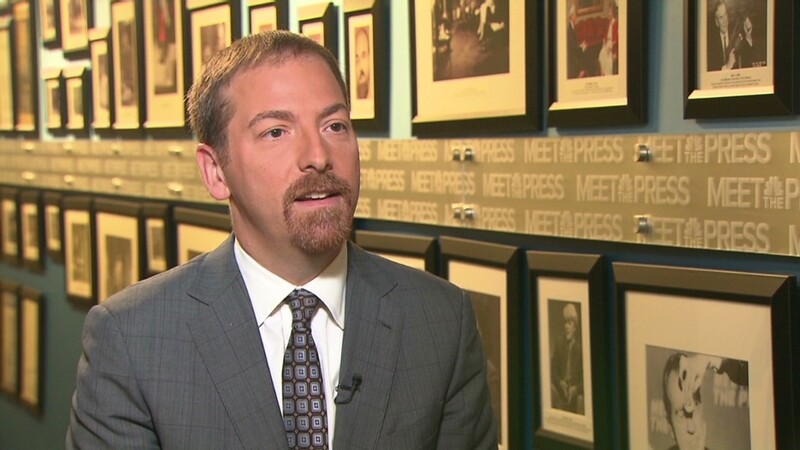 "Meet the Press" has slumped in the years since longtime moderator Tim Russert died in 2008. Gregory subsequently took over, and tried hard to maintain the show's luster and ratings strength, but it slipped from first to second place and occasionally third place in the Sunday morning race. Todd cautioned that "this isn't going to be turned around in six days or six weeks," calling it a "gradual process." When I asked Todd if he thought "Meet the Press" was "broken," he said no, but that "political journalism is going through the same issues that Washington politicians are going through." The American public, frustrated with Washington paralysis and pettiness, has "lumped us in the media as part of that frustration -- that we don't get it, in the same way that Washington politicians don't seem to get what's going on in the rest of America." And that's at least partly a fair critique, he said, citing the divide between the relative economic resurgence on the "coasts," where many journalists reside, and the "different story" that's unfolded in the middle of the country. As part of his first show, Todd purposefully invited three mayors from other cities for a conversation about "what's working" elsewhere. "One of the things that I've heard from viewer feedback is a lot of people watch these Sunday shows to learn," he said. "They want to learn more. They want to go deeper. They want us to bring in the smartest people around." That said, in-depth political interviews will still be at the heart of the program. "In the cable landscape, five-minute interviews don't give you the depth that people say they want," Todd said. He acknowledged that TV bosses like to speed up shows by shortening interviews, "but I'd like to think if you're doing a compelling interview, you shouldn't want to do that." "I think Sunday morning is different," he added. "I think people sit back." Case in point: Todd was used to sitting at home with his iPad and a cup of coffee on Sunday mornings. Now he'll be coming into work before dawn. Since Todd was appointed moderator last month, some conservatives have tried to portray him as a biased product of the liberal cable news channel MSNBC, where he hosted the 9 a.m. political newscast "The Daily Rundown" for nearly five years. To them, he said, "Look at my work. Look at the diversity of guests I had ideologically, geographically or ethnically." He brushed off what he called "the guilt by association crowd" and said media bias accusations are a "form of a campaign." Todd signed off the five-day-a-week "Daily Rundown" before Labor Day, and he's a bit worried about missing it -- "I liked having that daily outlet" -- but part of his assignment now is to nurture "Meet the Press" as a "seven-days-a-week source for politics and Beltway buzz," as an NBC executive put it earlier this year, back when Gregory was still in charge. "We want to show that, you know, 'Meet the Press' is coming to you, 'Meet the Press' is the political brand of NBC News," he said. That entails "building a larger, more thriving digital product," and maybe "getting into the documentary business" too, he added. Todd had little to say about the awkward transition between him and Gregory. But he did say that when the summer started, he did not expect to be the moderator of "Meet the Press" at the end of the summer.